Kim Jong-un made history this week when he met with South Korean President Moon Jae In for the Inter-Korean Summit. The summit ceremonies began with North Korean leader Kim Jong-un crossing the demilitarized zone into South Korea at Panmunjom—the first time a North Korean leader has been to South Korea. It is also the first time talks have been held between the two nations in ten years, and the third summit since the end of the Korean War. The stakes for the meeting are huge, as any failures to produce results could put the nations on a trajectory leading to military conflict between North Korea and the United States. On the surface the two leaders at the summit appeared to be in relaxed spirits in what has been termed as a day handshakes and smiles. 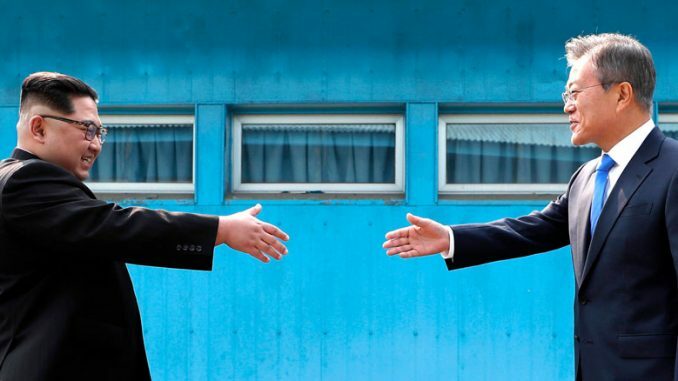 The summit appeared to be a success with the two sides agreeing to denuclearizing the Korean Peninsula. In a joint declaration of the summit, both sides agreed to cease all “hostile acts” against each other by May 1. “The two leaders solemnly declared before the 80 million Korean people and the whole world that there will be no more war on the Korean Peninsula and thus a new era of peace has begun,” the declaration stated. The talks are perceived as a precursor to a summit between Kim Jong-un and Donald Trump in June. Any notion of denuclearizing North Korea will have to be negotiated through the United States which maintains a force of more than 23,000 soldiers along the demilitarized zone in South Korea. The talks in June will no doubt have even higher stakes. Again, any failures, or shortcomings could put North Korea back on to the road to military confrontation with little or no options to deescalate tensions. South Korea, the United States, and most of the world are still wary of Kim Jong-un’s intentions. In the past he has exploited agreements to gain incentives only to renege on the agreements at a later date. Could that be his goal now? It is impossible to tell at this point. However, a historical turning point does seem to have been reached and is off to what seems to be a good start. Washington Post reporter for Japan and Korea, Anna Fifield, writes, “That Kim signed his name to a statement that even included the word ‘denuclearization’ marked significant progress after a year of threats and missile launches that brought the specter of war back to the Korean Peninsula.” The world watches.